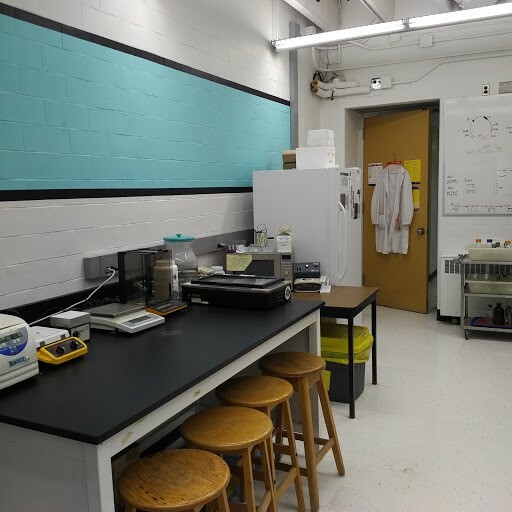 Our lab is located on the third floor of Biology 1 building at the University of Waterloo. We have our own tabletop centrifuges, thermal cycler, analytical and top-loading balances, -20°C freezer, and 4°C refrigerator. We share the -80°C freezer and 37°C incubator with the host lab, under the guidance and supervision of those in the Dr. Trevor Charles lab. Waterloo iGEM is thankful for the supervision and support members of the Dr. Trevor Charles lab have given our team. In Canada, all research practices involving biological materials are strictly regulated by The Public Health Agency of Canada. In addition, there are certain regulations that must be followed in every work place, as recorded by the Workplace Health & Safety Regulations. Furthermore, we also used goggles when necessary, such as when flash freezing cells in tubes using liquid nitrogen. Only those who were trained in cryogenic and compressed gas safety were allowed to collect and work with the liquid nitrogen. To maintain sterility and safety, we implemented laminar flow hoods, gloves, and lab coats into our everyday routines. Bunsen burners were carefully lit and never left unwatched. 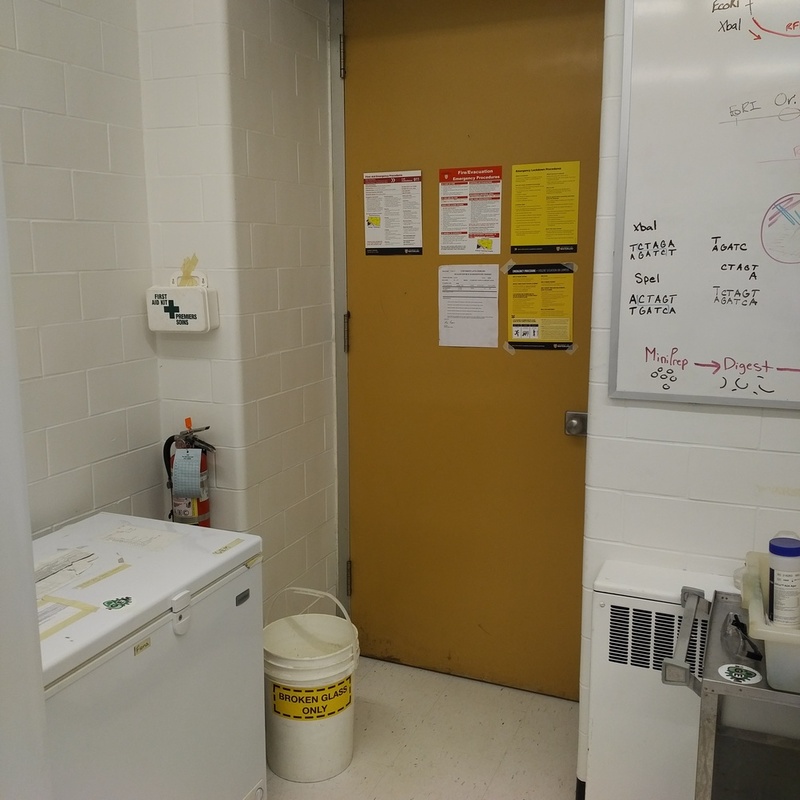 The fume hood was always run to keep toxic fumes from escaping before the certain chemicals were sent for disposal. All of our chemical solutions are labelled and safely stored in appropriate containers. Flammable substances and acids are stored separately in appropriate cupboards. We take safety seriously; from our Broken Glass Waste bin and regularly checked Fire Extinguisher to our fully stocked First Aid Kit and Safety Information signs on the door for all to see, safety awareness and procedures are not something we take lightly. We also dispose of our biohazardous waste properly. Materials such as contaminated gloves, pipette tips, KimWipes, etc. are put in Biohazardous Waste containers and compiled into our large bin. Once the bin is full, we safely transport it to the Hazardous Waste Disposal site on the university campus, where it is properly disposed of by qualified employees. We also take extreme care not to put any chemicals down the drain and contaminate the water supply. Instead, we add bleach to our bacterial solutions once we are finished experimenting with them, and then take them to be disposed of to the Hazardous Waste Disposal site. 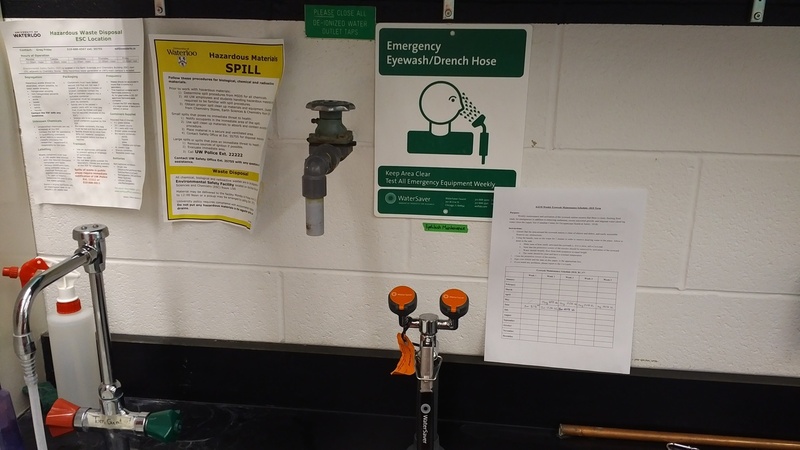 We have also implemented our Weekly Eyewash Maintenance program, to ensure that stagnant, dead-leg water is removed from the tubing and that the apparatus is always clear and working for any emergencies that may occur. 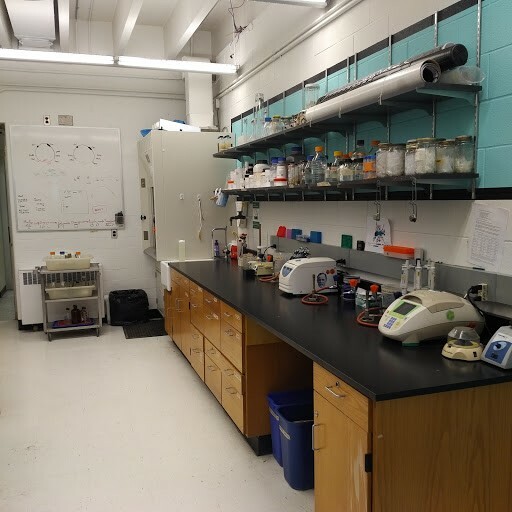 Overall, our lab and project had many safety features implemented in order to ensure everyone involved inside and outside of the lab were kept safe. Regarding our project, we had non-pathogenic chassis’ consisting of Escherichia coli (E. coli) strains DH5alpha, CC118 (lambda pir), and RU1012 deltaPompC-lacZ (JT2). 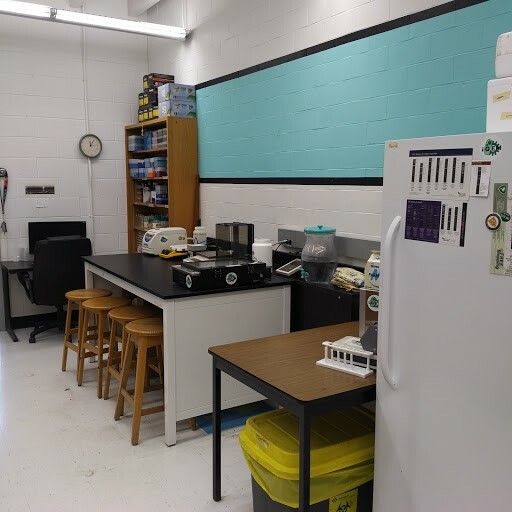 We wanted to reduce the risk to everyone in the lab and the surrounding community by using Biosafety Level 1 organisms. Thus, the risks and potential hazards are minimal. The parts that were chosen were also designed not to harm humans, animals, or plants. Instead, we worked with optogenetic systems, such as the cCas/cCar system, that only affected the bacteria by altering their growth using light. There were no safety problems with shipping the DNA parts to the Registry.